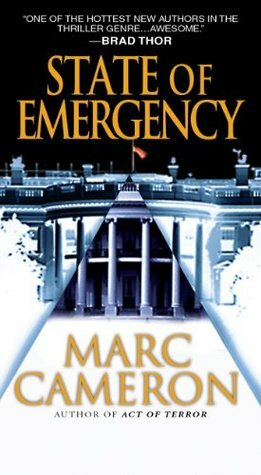 State of Emergency by Marc Cameron is the third book of the Jericho Quinn series. In the USA, a college student dies in suspicious circumstances only minutes after entering a hospital's emergency room. Before dying, she confesses that she has been carrying drugs in her stomach, concealed in condoms, and fears one of them must have burst. However, the speediness of her demise suggests a cause of death other than a drug overdose. It is soon confirmed that the actual cause of death is radiation poisoning, and that the girl obviously didn’t know the true nature of the items she was smuggling. When a second victim dies in similar circumstances, this time in Russia, the authorities in both countries are put on high alert. Soon after, bombs exploding minutes apart in both San Francisco and St Petersburg are found to be contaminated with radioactive material, and kill hundreds of people. Then a professor is abducted, who just happens to be an expert in nuclear physics. This could be confirmation of intelligence reports that a black-market arms dealer has got his hands on a relic from the Cold War - a Soviet-era nuclear device. Winfield Palmer, personal security adviser to the President reunites Quinn with his friend Jacques Thibodaux, and CIA agent Ronnie Garcia and sends them on a mission to befriend the black-market arms dealer, trace the nuclear device and take down the terrorist operation. As is usual with Jericho Quinn novels, the action is fast paced and described in lots of short chapters that keep you wanting to keep reading. This particular story is boiled down into half a dozen different plot threads, and the author does a good job of switching between them, not dwelling too long on any one situation, keeping you hungry for more. There are quite a few locations, and a whole host of characters introduced throughout the book, and at times there can be a lot to take in. It could have got very confusing, but again, I think the author does a good job of keeping a tight reign on what’s happening to who, and where, and provides reminders at convenient points so you don’t get lost in the detail. Despite the fast pace, the large cast of characters, and the non-stop action, there was some time spent on character development, and we learn a little more about the main players in the series. As usual, if you hadn’t read either of the previous two books in the series, you could enjoy this novel as a one-off read, although I’d recommend starting at the beginning of the series simply because I think the previous two books were a little stronger on plot. However, overall I thoroughly enjoyed this instalment, and would recommend it to anyone who likes their action thrillers to be thrilling and full of action.